With an extraordinary true story as the focus, The Athlete is insightful and inspiring, but stiff performances from its supporting cast and its slow third-act means it fails to get out of the starting blocks. Written and directed by Davey Frankel and Rasselas Lakew, The Athlete (original title: Atletu) tells the inspiring true story of Abebe Bikila, an Ethiopian soldier who became an Olympic sports legend overnight in the 1960s. Played by Rasselas Lakew, Bikila first won gold in the marathon at the 1960s Rome Olympics, before winning again in Tokyo four years later, becoming the first person in history to win consecutive Olympic gold medals in the marathon. Known by many as the world’s greatest long distance runner, just five years after winning his second gold, Bikila was involved in a tragic car accident, leaving him paralysed from the waist down and thus unable to compete in future marathons. The Athlete - which was actually made in 2009 - takes a closer look at Bikila’s inspiring quest for life after his career came to a tragic end, examining his later ventures into archery for the Paralympics and handicapped dog sledding in Norway. With an extraordinary and remarkable story at the hub, it would take a heart of stone not to find The Athlete moving and inspirational and Bikila’s drive, determination and ambition are hard to fault. There are plenty of revelatory moments of interest for audiences previously unaware of Bikila’s story, particularly his insistence that he ran barefoot in competitions because the shoes he was given to wear in Rome hurt his feet. The well edited blend of feature narrative and archival footage also works nicely, switching from Ethiopian landscapes to Rome’s sun-drenched streets and giving an insightful glimpse into Bikila’s character and his various international achievements. 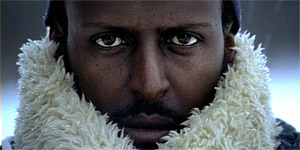 Despite a fascinating story at its helm, there’s something a bit lifeless about this biopic, whether it’s down to the stiff performances from its supporting cast (particularly Dag Malmberg’s wooden turn as Abebe’s friend Onni) or the slow-paced third-act, it is hard to pin point, but viewers expecting an energetic and well acted documentary-style feature film will be disappointed. The dramatic car crash incident that ultimately transformed Bikila’s life also fails to deliver the sufficient impact and emphasis it deserves. Despite its flaws, there are some profound and revelatory moments in The Athlete, thanks to Bikila’s achievements but if you’re after a dose of drama and excitement, this might be one to miss.